The banks of the Seine , the Latin Quarter , its typical cafes and restaurants, the Flower Market, Notre-Dame, the Louvre… All the charm of memories is here, in the hotel which was the starting place for the Beat Generation. 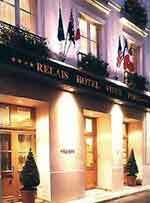 The Relais-Hôtel du Vieux Paris has a history all its own! Built in 1480, it belonged to the Duc de Luynes and the Duc d'O and was once the dwelling place of Pierre Seguier, the true Marquis d'O. In the 1950s and 60s, american poets adopted the site and in the same movement created the "Beat Generation". Among them were Burroughs, Kerouac, Ginsberg, Corso.